February is already here which means it’s time for Mardi Gras! When you mention Mardi Gras, people usually think of parades, Creole food, and lots and lots of beads! 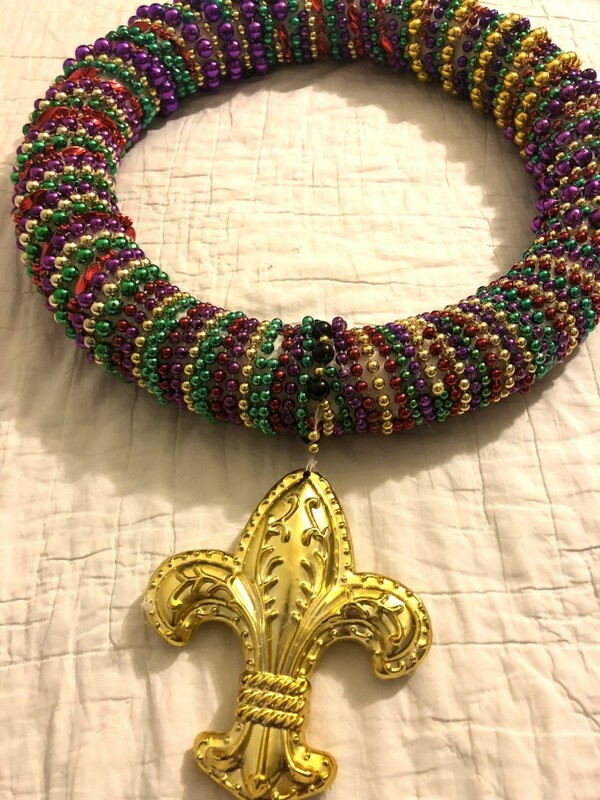 If you ever go to a Mardi Gras parade, you may find yourself going home with more beads than you know what to do with. 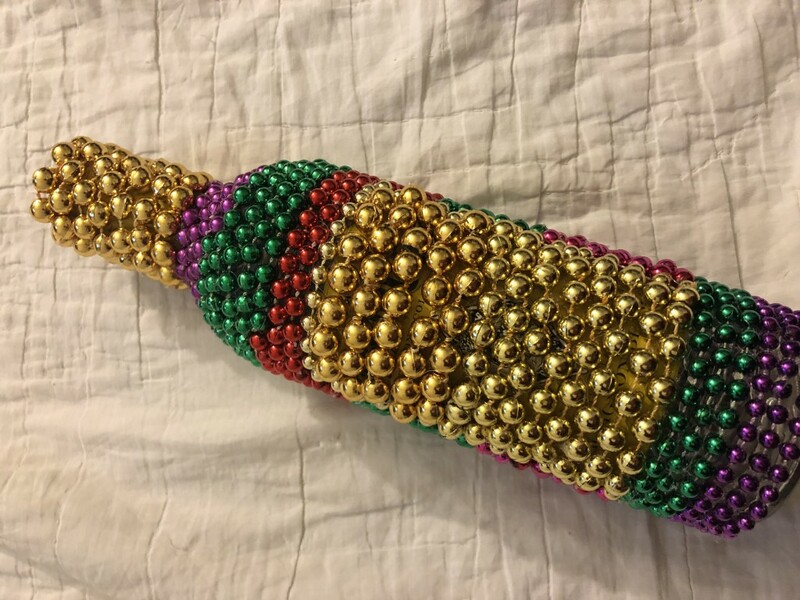 Instead of throwing away those beads, why not use them to add some festive spirit to your home or next party! We had loads of extra Mardi Gras beads in the warehouse, so I decided to try a couple DIY ideas! I sat in the living room, streamed some movies and got to work! I decided to start off with an item that seemed easy. 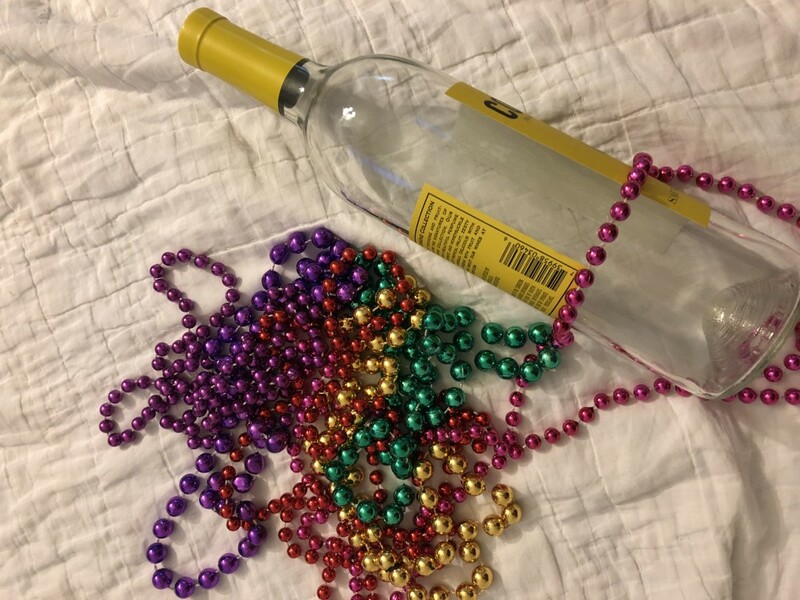 Wrapping beads around a wine bottle seemed easy enough. I chose an empty wine bottle, although you can do this project with a full bottle. I didn’t remove the labels from the bottle because I was too lazy to soak the bottle to properly remove the labels. However! I had an idea to use the labels in my bead design. 2. 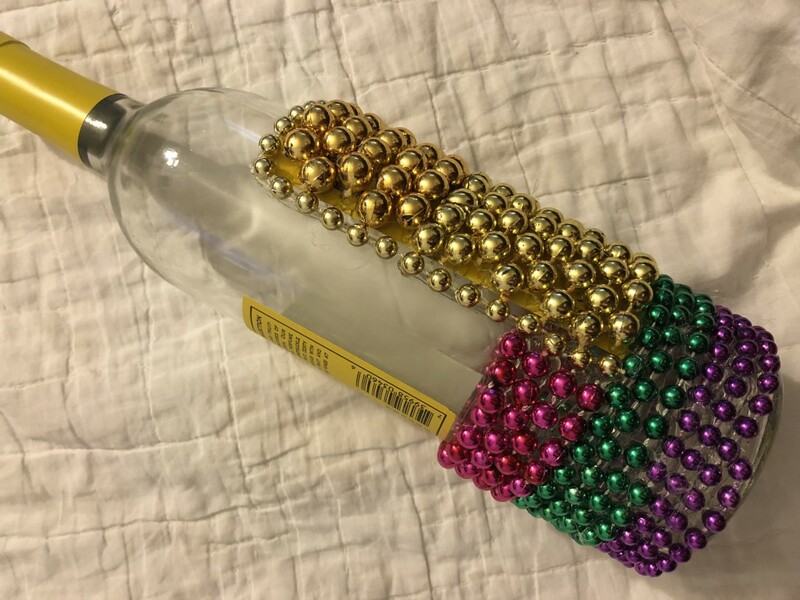 From there I simply started at the bottom from the bottom of the bottle, gluing a string of beads, making sure to wrap them closely together. 3. 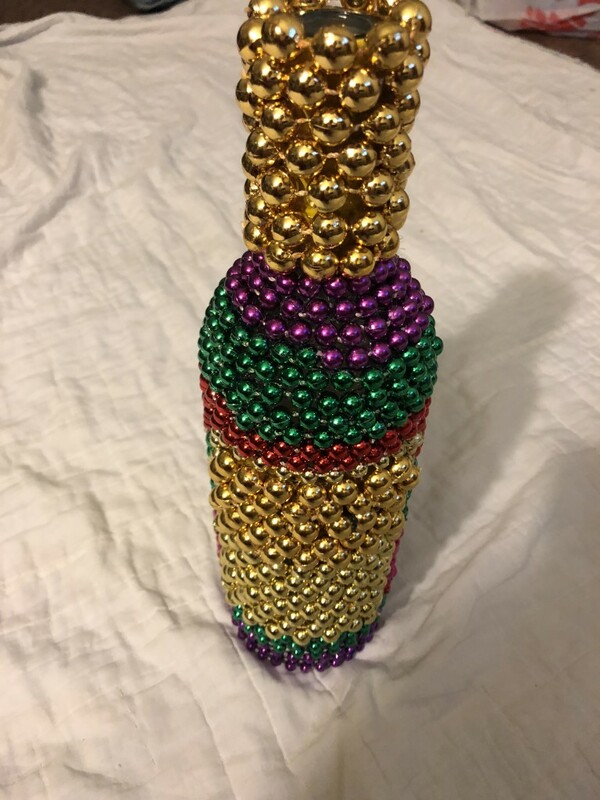 I decided to use the gold beads to cover the yellow label on the wine bottle. This really helped since I the color of the label peaked through the beads. 4. The only other place I used gold was to cover the the neck of the bottle which was also covered with a yellow sticker. Overall, this was an quick and easy project! It’s a fun way to serve wine or just leave around as decorations. I would even recommend filling the bottle with fairy lights and making it a cool light up centerpiece! If hot gluing beads to a wine bottle was easy, doing the same to a foam wreath should also be quick right? That’s what I thought before it took me an extended movie marathon to finish! I’m guessing this project normally doesn’t take this long. I am just an easily distracted person. 2. Glue beads to wreath by spiraling them around it. Be sure to leave enough space in between each spiral to do alternating colors. 4. 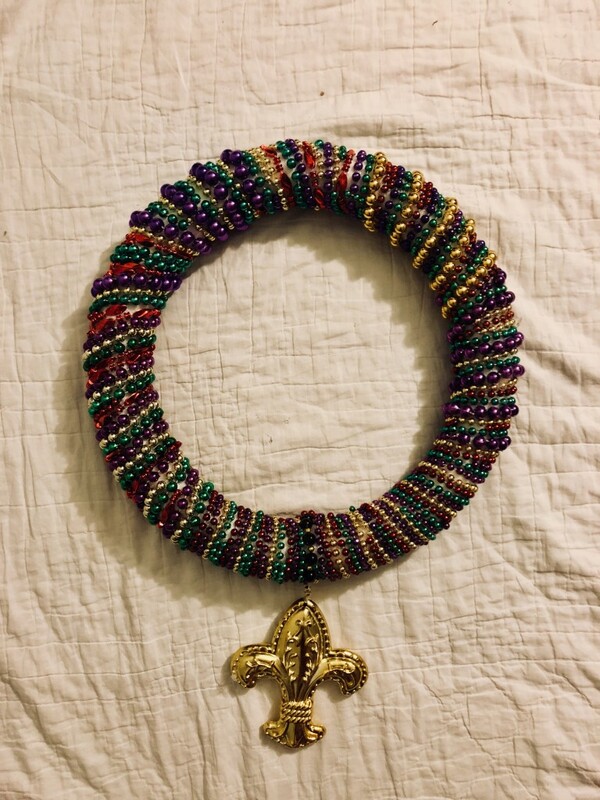 To finish off the wreath I added a Fleur de lis pendant that was attached to a large set of beads. To do so, I cut the necklace on both sides of the pendant to only leave enough beads to wrap once around the wreath. I ended up with a cool decorative element to the wreath that also doubles as a door knocker! Although time consuming, this was still a very easy and fun project to do. I would definitely recommend it to anyone who’s got some party planning time on their hands! 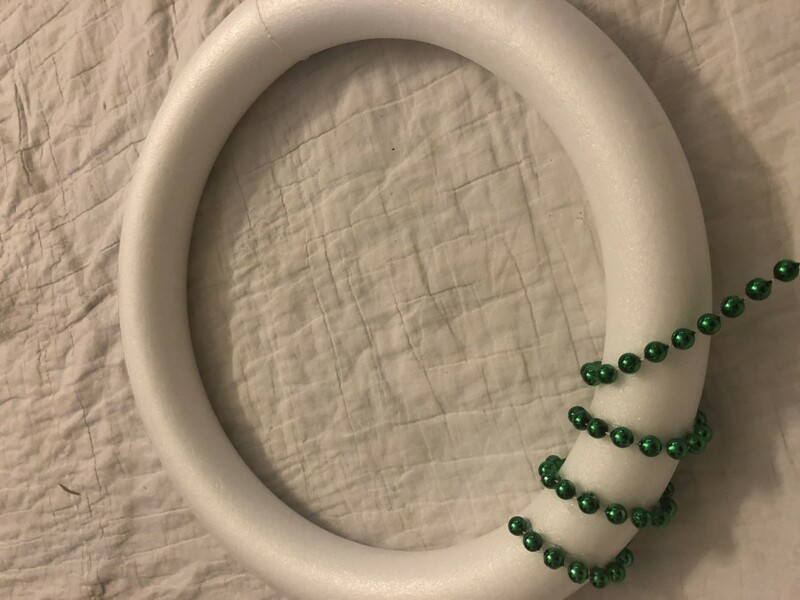 Now you’ve got two cool and fun ideas to use when decorating for your Mardi Gras party! Mardi Gras is early this year, so time to get to planning! Anime Wigs: The Cheap and Easy Way!